Religious temple in a Metropolis node. 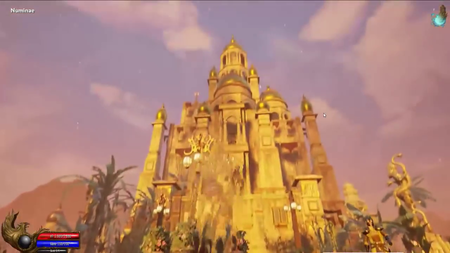 There are six religions in Ashes of Creation. 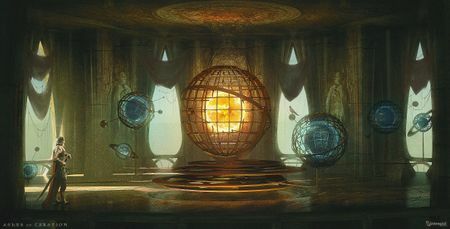 "Planetarium" concept art by Ryan Richmond. The ten deities within Ashes of Creation formed a pantheon of gods. There was a celestial struggle among the gods that fractured them into good and evil. Early in the creation of the Universe the pantheon of gods was split. Some gods influence the corrupt side of beings that exist in the Universe. It is possible through questing and player decision to join or worship those gods. It is possible for some storylines to relate to a darker/evil path, if a character should choose. The gods in Ashes of Creation represent different aspects of the Universe, and feelings as well. 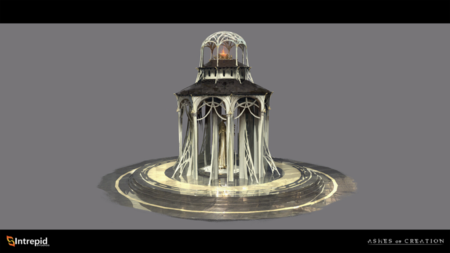 Alpha-0 Empyrean temple concept art. 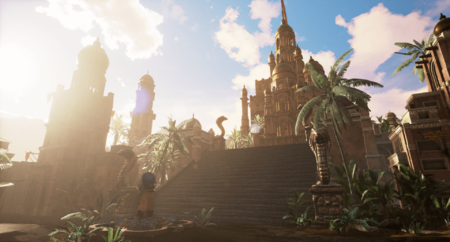 Pre-alpha temple by Michael Bacon. Pre-alpha religious temple in a metropolis node. 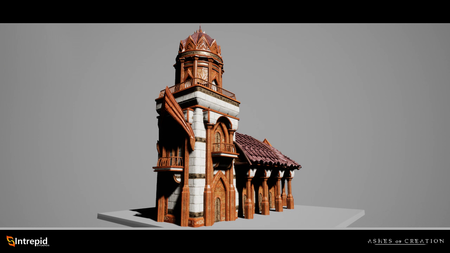 Temples are a type of building in Ashes of Creation that unlocks at Stage 3 (village) of a Divine node. Temples built in nodes progress a religion within Verra. There will be competition between religions to build their temple in nodes with vacant temple slots. The orders of the seven are religious organizations corresponding to the seven grand temples of Verra. The Order of hope is an Alean human order based in the capital city of Aela. The patron deity is Resna. The Order of fate is a Kaivek orc order headquartered in the capital city of Ren. Patron deity is Norlan. The Order of truth is a Pyrian elven order headquartered in the capital city of Amera. Patron deity is Shol. Religion is intended to be a motivator, not an aesthetic. Choosing a religion enables a player to walk a light or a dark path. Strong religions provide augments that can be applied to a player's primary skills. There are player progression paths within a religion. Players may follow only one religion at a time. Religions will have a ranking system. Changing religion will cause loss of progress in a player's previous religion. 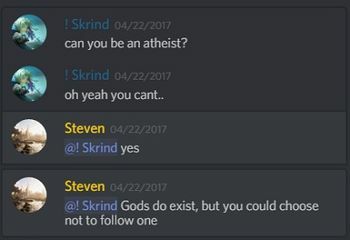 Players may choose not to follow a religion. Players may be able to build shrines on their freehold plot, based on their progression within their religion. Shrines may grant access to certain tithes that can be made to your deity. These could be a stepping-stone to unlock deeper progression within a religion. Shrines will not provide the same benefits as Temples but they are the "next best thing". 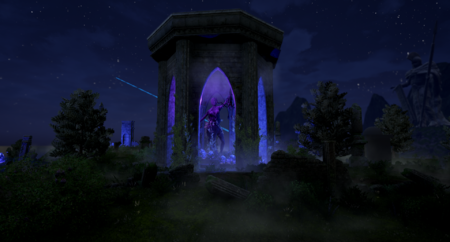 Players may be able to pay to use other player's freehold shrines. ↑ Node series part II – the Metropolis. ↑ 3.0 3.1 3.2 3.3 3.4 3.5 Livestream, 26 May 2017 (15:37). ↑ 5.0 5.1 Livestream, 26 May 2017 (10:58). ↑ Livestream, 8 April 2018 (AM) (16:50). ↑ 7.0 7.1 7.2 7.3 Livestream, 8 April 2018 (AM) (10:02). ↑ 8.0 8.1 Interview, 31 October 2018 (6:00). ↑ 9.0 9.1 Livestream, 3 November 2018 (0:01:18). ↑ 10.0 10.1 10.2 10.3 Livestream, 3 November 2018 (0:00:20). ↑ 11.0 11.1 Livestream, 3 November 2018 (0:06:56). ↑ Livestream, 3 November 2018 (0:00:39). ↑ Livestream, 16 October 2017 (13:54). ↑ Livestream, 12 May 2017 (54:35). ↑ Livestream, 31 October 2018 (52:38). ↑ 16.0 16.1 16.2 16.3 16.4 Livestream, 8 May 2017 (44:51). ↑ Livestream, 1 June 2017 (33:40). ↑ 21.0 21.1 Interview, 20 October 2018 (0:00). ↑ Livestream, 1 June 2017 (34:12). ↑ 23.0 23.1 23.2 23.3 23.4 23.5 23.6 23.7 23.8 Interview, 11 May 2018 (58:07). ↑ Livestream, 24 May 2017 (9:58). ↑ Interview, 27 April 2017 (0:17). ↑ 26.0 26.1 Livestream, 4 June 2018 (2:18).